This System Will Allow users to register their complaints through any telephone at any time of the day or night using an IVRS(Interactive Voice Response System ). 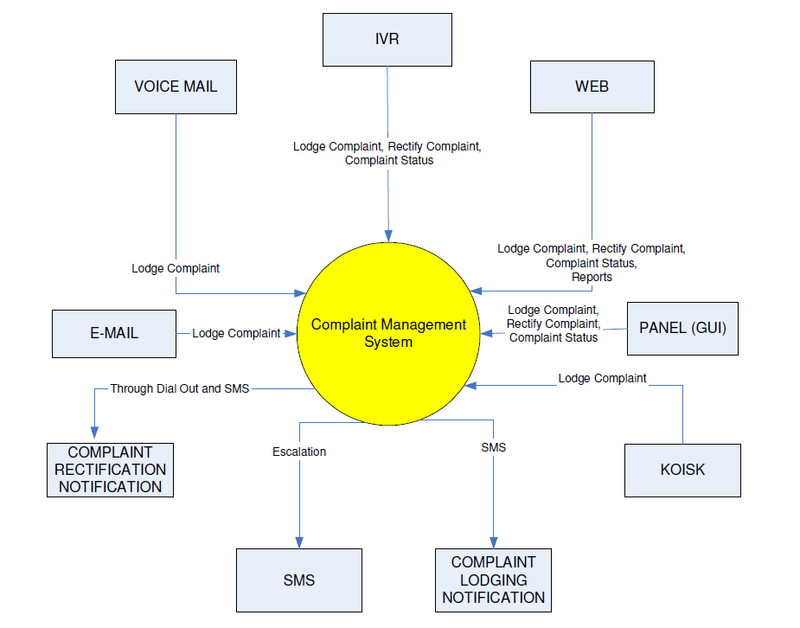 (The system can be interfaced with the web enabling users to log in their complaints through the internet/intranet also ). The IVR system is multi-lingual. The user needs to know only how to use a telephone. The complaints are registered easily and quickly and the caller gets a docket number. This is used to check the status of your complaint. The users can directly enter the Complaint code or can be guided by voice menus in simple language to register their specific complaint. In addition, the appropriate technician/repair person to service the complaint is also informed over a voice call or SMS depending on his choice with details (complainant’s house number, nature of the complaint, time of complaint ) so that the complaint may be serviced.